After watching the XBOX Daily Developer Interview on Mixer... I hope it comes out great. Last edited by gerrythedon; 03-01-18 at 07:48 PM. So is this basically the same game that came out on Oculus Rift? It had to be remade and was fleshed out to a full game without VR. Yeah, I thought this game looked familiar and didn't realize it was the Oculus game. I heard it wasn't very good. To be fair most of the mixed reviews were because it wasn't a good fit for VR. All that grimdark, post-apocalyptic stuff shown at E3 and this is the one my wife and I "oohed" over the most. That and OG Xbox backwards compatibility. Poor controls and a lousy camera doom the otherwise adorable-critter platformer Super Lucky's Tale. I was just checking reviews also and it's funny the destructoid review says the exact opposite about the controls and that it plays great. They also don't even mention the camera. So far it sits at a 66 on Metacritic with 18 reviews. Sounds generic and forgettable. I'll pass, at least for now. Maybe in a year when it's cheap on sale. That new Sonic game looks terrible like all the rest (that are made by Sega). I thought you still hadn't played much of Yooka-Laylee why don't you play that if your looking for a fun platformer. Or Super Mario Odyssey, Knack II, A Hat in Time (these are all highly rated platformers). We played Knack II for a few more hours this weekend and I'm still surprised how fun and enjoyable that game is, especially with younger kids that don't play games often and are not that good. It seems like it's built for them. I had planned on waiting on this game due to the mediocre reviews and then a copy showed up on my doorstep (I forgot I had preordered it). And unfortunately it is indeed a bad game. I had hoped at least it would be an average generic platformer but it's worse than that. Both the cameras and controls are extremely poor. The second level is a 2D level and it's got the most basic platforming jumps that should be super easy but when you jump on a platform sometimes your character continues to walk forward after you've jumped on one and will just walk right off to his death. I ran out of lives and had to restart the level on the most basic rotating platform just trying to get an understanding on what was going on with the controls. The 3D levels aren't much better and do the cardinal sin of 3D platforming where it is very hard to tell where your character is going to land when they jump. I made it about an hour and gave up. I'm enjoying this much more then I thought. I'm not having any major issues with the controls or camera, so it's weird that seems to be such a big range of opinions on how those things are in the game. They could be a little tighter, and the worlds shouldn't let you fall to your death so easily, but it hasn't been anything particularly frustrating or tough after getting the hang of it. I just made it to the 3rd hub world, and have been taking my time collecting every single clover and all the objectives in each level. It's not super deep or amazing, and probably a 7/10 game overall, but I think it's decent for the price and some of the puzzles are fun. And... finished. Fun little game, longer then I thought it would be. Not too difficult, and it was nice to play something lighthearted after more serious stuff. Guess I should finally play it. Ten days ago, a question was posed to the Super Lucky's Tale Twitter account as to whether the game would ever receive any DLC or a sequel. The answer was that there were plans for this and that we would be seeing Lucky again, although it wasn't clear whether this was referring to DLC or a sequel. It turns out they meant DLC, because a new "Gilly Island" expansion has surprisingly been released on the Microsoft Store today. The DLC adds 18 achievements worth a total of 500 Gamerscore. "Gilly Island" is available right now for US$4.99 / £4.19 / €4,99 and can be purchased from the Microsoft Store using the button below. Coinciding with the DLC's release, the full game was part of the list of titles that joined Xbox Game Pass today. 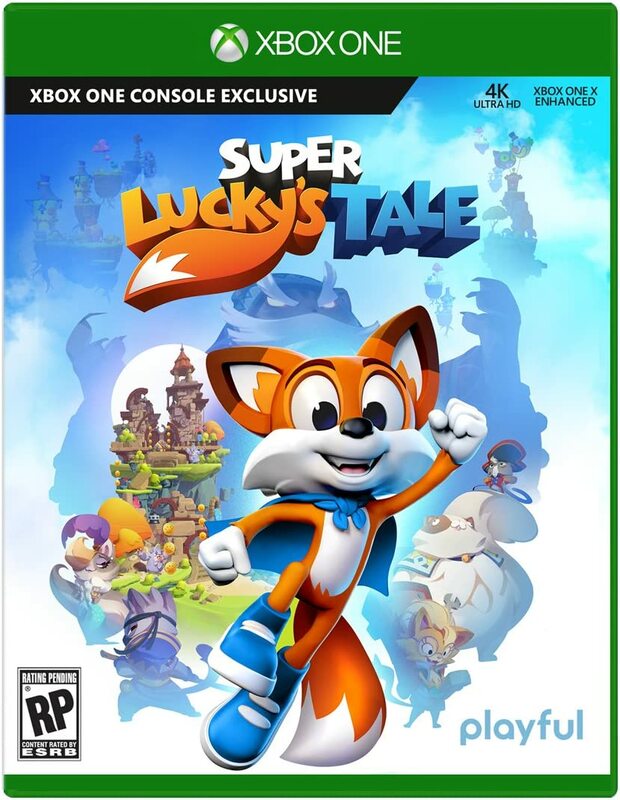 Microsoft has announced that a new Super Lucky's Tale DLC chapter is available now, seeing the plucky fox engaging in his "most daunting challenge yet" with the 'Super Lucky's Tale: Guardian Trials'. An 80s retro-themed boot camp adventure, the latest DLC will see Lucky undergoing training to become a fully-fledged Guardian. Featuring more puzzles, platform jumping, burrowing and rolling, the Guardian Trials will put Lucky though his own taxing 80s-style training montage, with new costumes to complement his Rocky-esque adventure, including unitards, leg warmers, wristbands and headbands. Super Lucky's Tale: Guardian Trials joins the Gilly Island expansion as the latest DLC for the game, available now for $4.99/£4.19 on Xbox One and Windows 10 PC. Check out Lucky in action in his own 80s training challenge by watching the trailer below.